Rollins College partners with Wayne State University to offer students to opportunity to spend the spring semester immersed in German culture and language through JYM Munich. Students on the JYM program will take language courses through JYM. 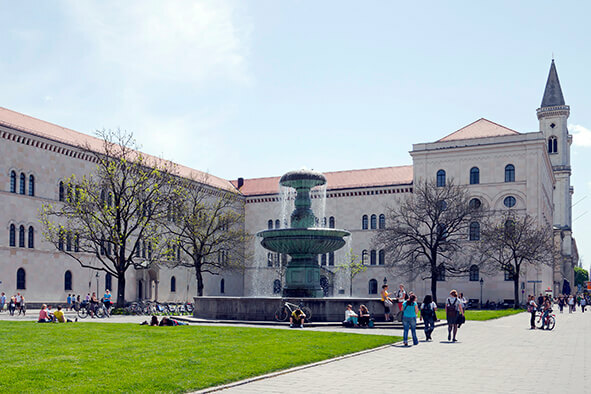 Students also have the opportunity to enroll directly into standard University courses at one of Germany’s premier institutions, Ludwig Maximilians Universityät München (LMU Munich). Rollins students in this program will start the semester in Münster where they will take an intensive four-week German language course at the Kapito Sprachshule (Kapito). After brushing up on their language skills and experiencing life in Münster, students will travel to Munich to begin the semester at JYM. This program is only offered in the spring. JYM is a longstanding study abroad program in Germany run through Wayne State University. Through this academically dynamic program, you'll take a combination of coursework at Kapito language school, JYM Munich, and Ludwig Maximilian University (LMU). You'll start your semester at the Kapito Sprachschule in Munster, where you'll take a placement test that determines your level of German. Based on that level, you'll be enrolled in the appropriate language course. Regardless of which level into which you place, you'll earn 4 Rollins credits. This program lasts about four weeks, afterwhich you'll start your semester at JYM. During the JYM semester you can take a mix of coursework with JYM and with LMU. Course options include Art, German, History, Humanities, International Relations, and many others. Through that combination you're required to take at least 15 credit hours, and classes are usually worth 3 Rollins credit hours, so most students take five classes. Please note that all students must take JYG 3100/3200 Advanced German Language with JYM. In some cases, this requirement can be waived if the JYM Director determines a student’s German level is sufficient. Kapito Sprachschule (Munster) was founded in 1980 by several German language teachers who saw the need for a total immersion program for individuals wanting to work or study in Germany. Each small group is taught by two tutors, and from the very first lesson, the teaching language is German. When you first arrive in Munster you'll take a placement test that will determine your language level. Based on that level, you'll be placed in the relevant language course. Regardless of your level, the Kapito course will last for four weeks, just prior to the start of the JYM semester, and will award 4 Rollins credits. JYM Area Studies Courses are taught in German and utilize Munich's prestigious cultural, educational and historical resources as an integral part of the curriculum whenever possible. Courses may include visits to and/or assignments related to museums, archives, theatrical performances, or even travel beyond Munich. Each course is worth 3 Rollins credit hours. Ludwig Maximilian University (LMU) offers a wide range of academic subjects in the humanities, social sciences and sciences. Courses at LMU are each typically worth 3 - 4 Rollins credits. JYM students may also gain permission to do individualized research projects under the supervision of JYM faculty. For more information about the LMU courses, click here. Please keep in mind that because you are applying to the JYM program 6 - 8 months in advance of the actual start date, some of the specific details you might be looking for, such as course syllabi and schedules, may not yet be available. Students participating on this program will need to seek the appropriate departmental approval for all major/minor requirements and approval for General Education Requirements through Student Records. All courses on this program appear on the Rollins transcript as transfer credits and the grades are factored into the Rollins GPA except for the four-credit course at Kapito which will appear on the Rollins transcript as a Credit/No Credit Rollins course. Students who successfully complete the JYM program through Rollins will receive an official transcript from Wayne State University. It can take up to 3 months to receive the official transcript. Students live in furnished apartments with native German speakers. Common areas and kitchens are shared and students typically all assist with chores in the apartment. There is no meal plan in Münster: staff at Kapito will distribute a monthly food stipend to all students. Students may choose to cook in the apartment or go out to eat. Students will live with German and other international students in the Studentenstadt Freimann close to the city center. Each student will have his or her own small studio apartment with a private kitchen and bathroom and internet access. Each floor has a shared common area for socializing, watching television, etc. There is no meal plan through JYM. Students cook for themselves and/or buy meals out. As LMU students, they can use all of the University dining halls and cafeterias which offer very inexpensive meals. In Münster, Kapito offers free events and activities (some of which are included in your program, others that will be an additional cost). You can actually download the KAPITO app in the Google Play Store for information regarding activities and schedules. There is also an online (and print) resource for all the latest and greatest activities and events happening around Münster. In Munich, JYM organizes a wide variety of activities and events, including networking events, lectures and performances. You'll have access to all LMU clubs and activities, and JYM will also help you get involved with local organizations and activities. MESA, the Erasmus student organization sponsors many trips and activities that are open to all students and are typically offered at discounted cost. Finally, the student housing, the StuStadt, offers tutoring programs, help finding part-time work, extra-curricular workshops and courses, and has its own cafes and Diskotheken. München is a great starting point from which you can discover the rest of Europe. The main train station is your travel hub to Berlin, Frankfurt, Paris, or Vienna. As most European Union countries are part of the Schengen Agreement, you won’t even need a special visa to visit them – your student visa or residence permit for Germany will be sufficient! Travel around Germany is made easy and inexpensive via the national rail service, Deutsche Bahn. Tuition and program administration, accommodation, complete medical and emergency insurance, orientation, internet access, cultural activities, course-related activities, and residency permit.